The sharp stipple engravings are from the French medical reference book entitled Flore Medicale. The multi-volume publication was illustrated with images by Pierre Jean Francois Turpin and authored by F. P. Chaumeton, J. L. M. Poiret, and J. B. Chambert. This "Nouv. publication" was published in Paris in 1828-1832 by C. L. F. Panckoucke. Turpin was a man of great botanical talent. After meeting well-known botanist and botancial artist Alexandere Poiteau while stationed in Haiti with the French army, Turpin followed a path that led him to fame: "Pierre Jean François Turpin was possibly the greatest botanical genius of all the French botanical painters of his day." (The Art of Botanical Illustration by Wilford Blunt. Collins: 1971). Iris germanica var. vulgaris is a recent addition to my collection and was identified with a lot of help from Milan Blazek. 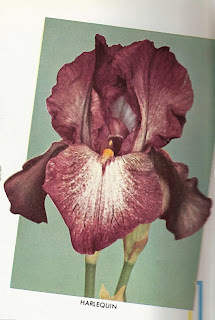 I think this iris to be an amazing part of Iris History which still needs to be discovered. Just how did this iris get to be growing in New Zealand? How did it get to England? was it brought there by the Roman's? and just how does an iris have so many varieties when is considered by many to be sterile or not to set seeds readily?More on this in future posts. I. germanica var. vulgaris. Common in England. Standards distinctly blue-purple, Falls a slightly redder shade. Beard almost white, yellowing at base. I.germanica. Linnaeus 1753 This is no individual variety but an abstraction from a group of varieties which agree in the following characters;- Leaves of some length in winter; flower stems liable to destruction by frost before they emerge from the leaves; stems bearing a terminal head of two flowers, a lateral branch three or four inches long and between them another short head or two; spathes scarious in the upper half, green, more or less flushed purple at the base; capsules narrow, oblong, triangular in section; seeds very few,oval not flattened; standards usually a little paler than the falls and often bearing a few, straggling hairs at the haft. Red sky in morning, shepherds take warning. New Lambs are not too happy! When first introduced Alcazar had clearer color, more vigour, more adaptability, better branching, bigger size, better substance, and better disease resistance than its contemporaries. 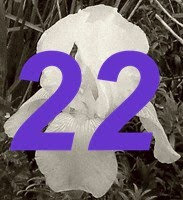 At the time nearly every other garden iris of its day was diploid, Alcazar was one of the first garden tetraploids, having a chromosome count of 2n=48. The significance being when introduced it represented a great advance over other garden irises of the time, and this is due in no small way to Alcazar's, I.trojana parentage. June Flowering Irises, General Collection. The Dean lris Gardens, Moneta, California.Choice Iris 1921-1922. Squalens Group; The standards are clouded shades of copper, bronze and fawn. Alcazar. S. lavender-violet; F. velvety purple, with bronze veinings. Beard raw sienna color. Handsome, Very large flower and tall grower. Each, 75c. Alcazar (Vilmorin 1910) Divisions sup. violet clair, div. Inférieures violet foncé. Treasure Oak Nursery, Mays Landing, New Jersey, Catalog of Select Iris and Peonies, 1923. The Best and Rarest of the Iris. Trojana X (squalens x -)? . F.-Deep purple (Cotinga Purple) bronze veined at the haft. One of the very handsome dark purple Irises of fine type and to be highly recommended as a specimen plant. Its growth is good, producing tall, strong, and widely branched flower-stalks bearing large blooms of waxy texture. The foliage is well retained throughout the winter and the plant flourishes under the most adverse soil conditions. Frank W. Campbell, Detroit, Michigan. Rare Iris, 1923. The Rarest and Best Iris Gathered from all the Introducers. ALCAZAR (Vilm. 1910) S light mauve, F deep purple, haft bronze veined. Large waxy textured blooms on well branched stems. $1. Cayeux & Le Clerc, Quai de la Mègisserie, 8, Paris. Catalog 1923. Alcazar (Vilmorin 1910) S. clear blue, F. deep violet. Tall grower. Iris of great merit. Perry's Hardy Plant Farm, Enfield, Middlesex. New June Flowering Irises, 1924. Alcazar. One of the most magnificent of the older varieties, stout branching stems, bearing a profusion of well-built flowers; S, light bluish-violet overlaid bronze; F, deep purple with a bronze veined throat. 1/6 each. 89-ALCAZAR, T. B. (1910)-S. light bluish-violet; F. deep purple with bronze veined throat. A very striking flower. 42-inches.----------- ------ 30c. Vilmorin Andrieux & Cie, 4 Quai de la Mégisserie, Paris (1er), Deuxième Série, 1925-1926. 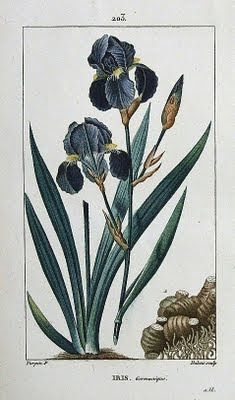 Iris Vivaces Hybrids, Série Générale. Alcazar (Vilmorin) Très grandes fleurs à divisions inférieures violet foncé, les supérieures violet clair, styles larges, jaun$atres. Plante très haute et vigoureuses, à floraison hâtive. U S Department of Agriculture Farmers Bulletin 1406, January 1926. Garden Irises B. Y. Morrison. For example, Black Prince is a variety which is notorious for its lack of vigor, and Princess Victoria Louise is so vigorous that it becomes almost weedlike in its increase. To illustrate the other point, the variety Gajus may be chosen as an example of the varieties which make small rhizomes, so that a clump may be much divided and contain many blooming points and yet come within a small area. The Alcazar variety makes large rhizomes that bloom a freely as those of Gajus but which appear to be less floriferous because clumps of equal size produce fewer stalks of bloom. 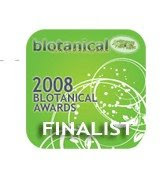 This apparent difference is somewhat offset in this case because Alcazar bears flowers several times larger than those of Gajus, but this is not true of every variety which grows from large rhizomes. CORNELL MEMOIR 100 Study of Pogoniris Varieties Austin W.W. Sand July 1926. Alcazar (Vilmorin, 1910)Color effect light hortense violet, velvety pansy-violet bicolor viened on bronze haft; size large; form long; open, oblong ; flowering habit free ; tall bearded class ; height 32 inches ; branching wide at center or above; A flower of extra substance ; firm texture ; slightly crêped surface ; good fragrance; An outstanding specimen plant, with very large well balanced flowers and excellent foliage. S. Light mauve or hortense violet, shaded deeper in the recesses of creped parts ; carriage cupped, arching ; blade obvate to fiddle-form, notched, undulate, ruffled and frilled, revolute, slightly crêped ; size2½ in. wide, 3 in. long. F. Deep velvety pansy-violet, the bronzed wide outer half becoming olive- yellow along the beard, veins ending abruptly with beard ; carriage drooping ; wedge shaped to oblong, slightly convex ; excellent velvety texture ; Minor parts ; beard coarse, dense, projecting, conspicuously broad, orange-coloured ; half broad flat ; reticulations broad, broken, widely spaced ; style-branches broad, over arching, light violet bronze on the margin ; crest bronzed, large, fringed ; pollen plentiful ; spaced flowers scarious, inflated. Growth vigourous ; increase rapid ; habit open to regular ; foliage stiff, leaves broad, deep glaucous green ; 4 blooms open at once, floriferous ; stalk erect, angular, with 9 or more buds. Trojana parentage. awarded a certificate of merit by the National Horticultural Society of France in 1909, and a first-class certificate by the Royal Horticultural Society, London in 1916. Iris Fields, West La Fayette, Indiana. Iris of Quality, 1926. 89 ALCAZAR. (Vilm. 1910). A very large vigorous bicolor. S. slaty bluish violet; F. deep reddish purp1e. We consider this the equal of Lent A. Williamson and one of the three best of the older varieties...........................................................$0.35. Lee R. Bonnewitz Catalog,Van Wert, Ohio, A Descriptive Iris List, 1926. ALCAZAR (Vilmorin) This is one of the best Irises in the world, and we do not believe we will have enough stock to fill all our orders, for its is an excellent value at the price. S. Light bluish-violet. F. deep brilliant purple, with bronze-veined throat. We have never heard of a disappointed customer, even when the price was $ 1.00. Two or more rhizomes at 30c each, five or more rhizomes at 25c each. Carl Salbach Berkeley, California, Irises Catalog, 1926. Alcazar (Vilmorin). 89-S. mauve, F. dark purple. The bronze and yellow at its center add to the beauty of this large, vigorous, well branched variety. 3½ ft. 50c. A.H.Burgess and Son,Waikanae, Wellington New Zealand 1927. One of the largest and handsomest Irises in the collection; a strong grower and most profuse bloomer. Standards light bronzy violet; Falls long of a deep velvety purple. Mid-Season 3½ft. 2 shillings and sixpence. 8.9. ALCAZAR (Vilmorin 1910). A giant flower. One of the largest and most gorgeous in coloring. S, light blue, flushed rose, F, rich velvety crimson-purple, heavily marked at base. 30c. Indian Springs Farm, Baldwinsville, New York. Iris Catalog, 1927. ALCAZAR (Vilmorin 1910) 8.9. A very large, vigorous bicolor. S. slaty bluish-violet, overlaid bronze; F. deep reddish-purple, with a bronze veined throat. 42 inches. Very similar to Lent A. Williamson, and one of the finest of the older Irises. 35 cts. each; 85 cts. for 3; $3.00 per doz. 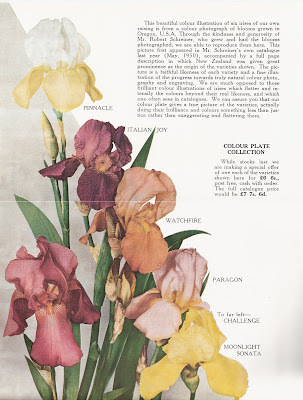 Lee R. Bonnewitz Catalog,Van Wert, Ohio, Peonies and Irises Catalog, 1928. ALCAZAR (Vilmorin) The standards of this variety are light blue-violet, and the falls are a brilliant purple, with bronze veining on the throat. It is one of the largest of the bright coloured varieties and blooms early in the season. Recommended for both size and beauty. Shenandoah Nurseries, Shenandoah, Iowa.Peonies Iris-Lilies & Bulbs, 1929. ALCAZAR, (Vilmorin 1910) 8.9. S, light bluish-violet, F. brilliant purple. One of the largest of the bright colored varieties. 36 inches............ $1.20. The Orpington Nurseries Co. Ltd., Orpington, Kent. Irises 1930. Alcazar (Vilmorin 1910). F.C.C. R.H.S - One of the handsomest bearded iris in cultivation, strong constitution, stout much-branched stems, bearing many large flowers, S. bright deep aniline blue, F. rich deep velvety violet-purple, heavily reticulated at the haft, with a prominent yellow beard. Very tall. Early. ALCAZAR 86-87 Vilmorin, 1910 42 inches. FRAGRANT. The Cornell Test Gardens rate this as one of the best ten (10). It is a gigantic flower, symmetrical in form, stately in its bearing, beautiful in colouring and delightfully fragrant. The standards are soft violet to orchid and of a glistening silky texture. the falls are rich velvety crimson-purple with a white throat heavily veined bronze. There is a bright orange beard and amber style arms. Certainly it does not leave much to be desired. 50¢ each ; 3 for $1.25 ; 6 for $2.00 ; 100 for $25.00. Royal Iris Garden, Frazer, Pennsylvania. 1932 Catalog. ALCAZAR (Vilmorin 1910). Well branched blue purple bicolor.It and L. A. Williamson are the first tall large Irises to bloom,and should be in every collection. Both are strong growers and sure bloomers. Harrisons Nurseries, 410 Albert Street, Palmerston North. Bulb and Iris List, Autumn 1933. 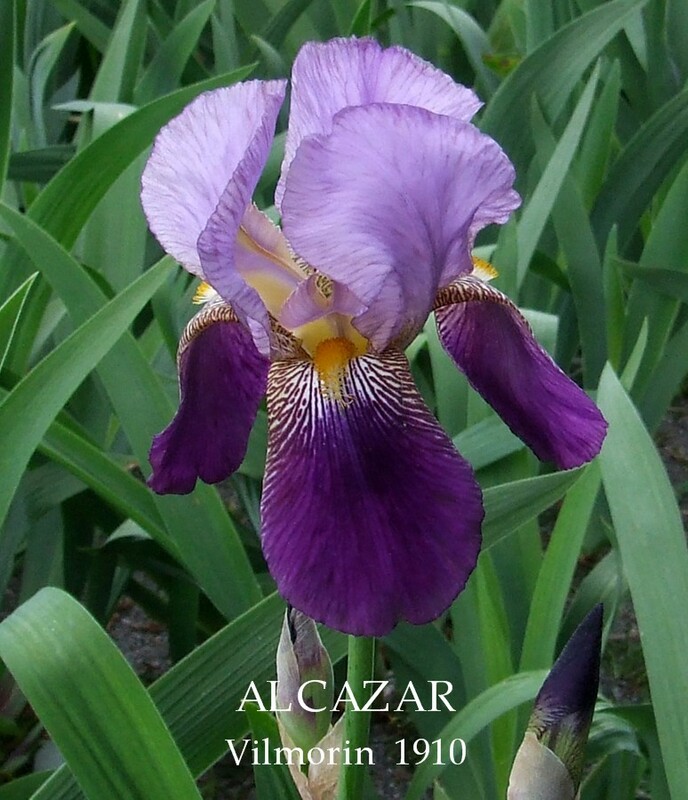 ALCAZAR - Standards (S.) light bluish violet, Falls (F.) dark purple, with bronze and yellow throat. Very large ; a favourite.................1/6. Carl Salbach Iris and Selected Seed Catalog, Berkeley, California, 1937. 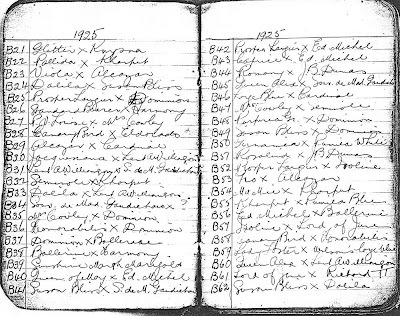 You might think what has a French bred Iris got to do with New Zealand's Iris heritage?Above is a scan of page of Jean Stevens Stud Book 1925 Crosses which shows the use of Alcazar plus many other French and British Irises, Jean used in her early breeding programme. 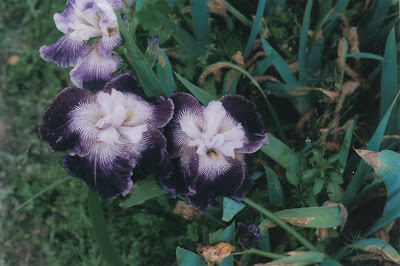 Some of the Irises listed I have recently referred to and featured on the blog and the entries indicate how important these irises where to the start of New Zealand's bearded iris breeding Heritage. Above Photo's of Alcazar were taken blooming in a abandoned section next to the Masterton Railway Station thriving among the weeds and neglect. Whats Truly amazing is the fact that one so called 'senior irisarian' in this neck of the woods has misidentified ALCAZAR and named it I.trojana and another in South Auckland has sold ALCAZAR to people as WINSTON CHURCHILL. For all those visitors lucky enough to live in America and Europe the 2008 Aril Plant sale is on. This is a great way to start a Aril Iris collection for a reasonable price. Take a look!! Unfortunately for New Zealander's due to MAF regulations importing plants at this time would prove to be difficult so you will have to wait for the fantastic seed sale. But if you join now you will receive your seed list in the mail when its due!!!! It is a another big thanks to Sarah Cook in England that New Zealander's get to see another of the great irises of Jean Stevens breeding lines which got major raps when first released 60 years ago. Photo was taken three weeks ago in Merian Park, Botanical Garden,Brüglingen, Switzerland. Since the introduction about twenty years ago of the first really large tall yellow iris,there have been many hundreds of this yellow colour raised; and slowly through the years,size of bloom depth of colour, form and substance have improved until today a golden iris which merits introduction must be good indeed. Despite this fact we had no hesitation in offering this new gold in completest confidence and wit our strongest recommendation. We are very pleased to say that our opinion of Searchlight quality has been fully endorsed by reports of its first flowering in America. The flowers have excellent substance, are very large, and possess that appealing form that is made up of a combination of flared falls and wavy petals.The colour is rich deep and even and not even at the haft is there any suspicion of the fine olive veins which subdue the brightness of so many gold irises 3½ ft.
SEARCHLIGHT Mrs J. Stevens, Reg., 1948. Sdlg. 3/T93. TB, 42″, M, Y4D. Clean gold self with self beard. Smooth. 3½ft: Description J. Stevens Studbook notes,‘1946 blooming’; (Golden Majesty) X (Naranja x Redmayne). 'Novelties' Stevens Bros 1948-49. A.H Burgess and Son, Waikanae Wellington, 1929 catalogue. SUSAN BLISS-- An exquisite pink-toned Iris. Well shaped flowers of a delicate shade of pale lilac rose. One of the best. Mid-season 3 ft.
Irises grown by Robert Wayman, Bayside, New York, 1930-1931. Peonies and Irises, Lee R. Bonnewitz Van Wert, Ohio, 1928. Puget Sound Iris catalog 1929. An exquisite pink toned iris. Large flowers of a delicate shade of pale lilac rose. When grouped in the border, the flowers appear to be a uniform shade of pure light rose-pink. Free flowering and of robust constitution, very tall, each spike bearing three to four flowers open at the same time. One of the very finest, 3 feet. Quality Gardens, Freeport, Illinois, Iris 1929. A uniform shade of deep rose pink. Beard light orange, adds a very pleasing colour tone. Very free flowering and of robust constitution. Very tall spike bearing 4-5 flowers open at the same time. Flower is beautifully shaped and of great substance. 3' 6" tall Rhizomes are always small . Strongly recommended. SUSAN BLISS. A "pink" which must be considered "old" as Irises are old. Its best points are freedom of flowering and increase, shapeliness of bloom and cleanness of colour. The branching is fairly good and the fact that it comes quite late in the season with Ambassadeur, Shah Jehan, etc. is a recommendation. About 3 ft. 3 in. in height. SUSAN BLISS was the other iris receiving most attention, and rightly so, for here was a great advance in the pink section. Mr. Mead said of SUSAN BLISS, "The next nearest to pink and most valuable of this class to date is SUSAN BLISS which is a most appealing, creamy pink tone. It is a tall Iris, from thirty-six to forty inches and of splendid carriage, fine form and substance. The standards are cone-shaped and resolute and slightly ruffled. The beauty of the flaring falls is enhanced by a fine yellow beard. The flower is a good size and as it has three flowers open at a time it would be very effective in mass." 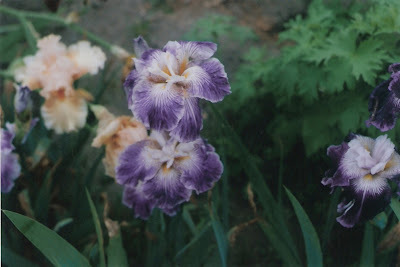 Mr. Mead's words were prophetic, for it is so, and SUSAN BLISS at the present time is one of our best irises of the pink group as it is a good grower, free bloomer and blends well with almost any color. This was a child of PHYLLIS BLISS. Rainbow Fragments : A List of better varieties. Haft............With light mallow purple reticulations. Stalk...........Erect, low branched to 39"
Remarks....Quite a favorite among the lighter pink-toned varieties. Susan Bliss is available in America and you could try Superstition Gardens and our English visitors could give Seagate Irises a call. Thanks for the photos of Susan Bliss taken in the last week or so. Photo Credit and copyright Anne Milner, Meadow House, holder of the National Collection Introductions of Arthur J Bliss sanctioned by NCCPG. 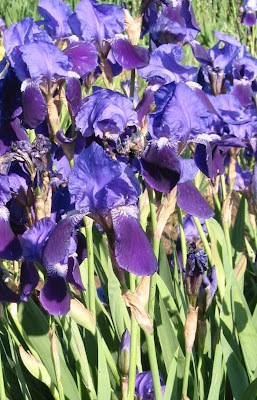 Anne Milner who has the Plant Heritage National Collection of Bliss Irises since 2008 now has a web site of her collection plus much more information and is well worth a visit. Its our 8th week Anniversary of the blog. 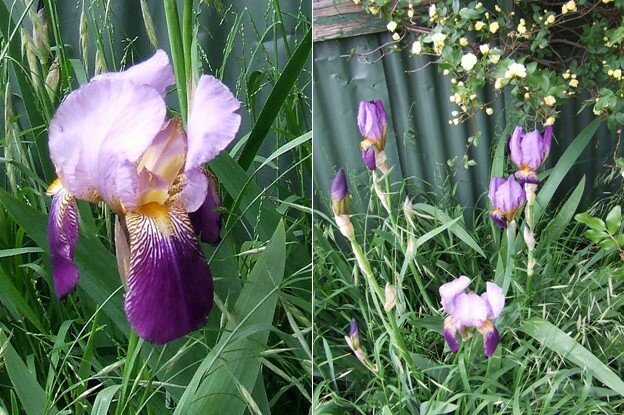 In that short period of time I have displayed 22 pictures of New Zealand Bred Irises. 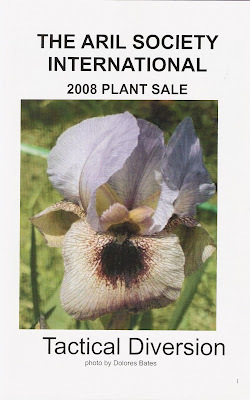 It took a tri-annual New Zealand Iris booklet from 2001 - 2007 to display 22 NZ Bred Irises photos, this is a disappointing 7% of all photos that they published within that period. What the hell were they thinking???? A total of 93 NZ Bred Irises were registered within this time frame, so what do most of these new irises these look like?? Knowledge Grows Only When Its Shared. Post more on this later. Yes you guessed it they are flats!!!! These shots scanned from photos. Welcome to the magical world of Ron Busch. Whats the up side in having a blog?. People from all over the world visit it and leave interesting comments about Historic Irises. 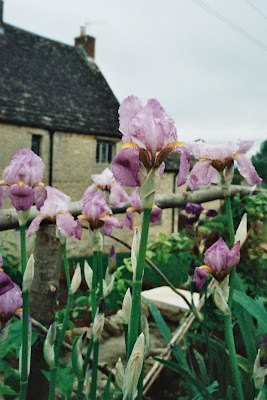 One such visitor has a collection of Arthur Bliss, one of the Legends of Iris Hybridizing, so over the next few weeks I will be highlighting his introductions and maybe some visitors to the blog will be able to help find some more of his irises. The above 1935 advertisement features Arthur Bliss Introductions apart from Melchior, bred by R. Wallace The iris 'Duke of Bedford' an Arthur Bliss introduction has already been featured on this blog in April. From the 1955 Schreiner's Iris Catalog: Technically a plicata, this fantastic "believe it or not" Iris looks like an Oncocyculus hybrid. The heavy silvery falls with perky horizontal flare are not only veined like a butterfly's wing but bizzarrely stippled and dappled chocolate and purple to match the feathery standards. Exotic, sophisticated, never to be forgotten, its weird beauty makes garden visitors exclaim." Photo enhancement on the left courtesy Schriener's Iris Lovers catalog 1956. Another two fantastic photo's from Sarah Cook taken recently in Merian Park, Botanical Garden, Brüglingen, Switzerland. Last week I had the privilege to speak to one of New Zealand's senior Iris Hybridiser's Ron Busch who when telling him about Jean Stevens exploits in Plicata breeding lines he expressed surprised that Jean Stevens in the late forties was doing so many marvelous things in this field. I have recently received a start of Harlequin from the official "Jean Stevens Collection" but as it has not flowered yet I cannot be certain if it is true to label. 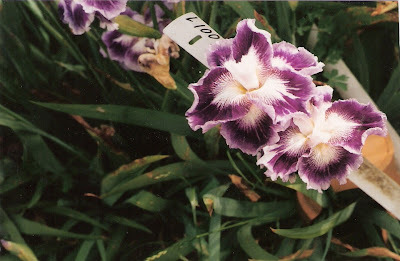 My understanding is that Harlequin has been in the collection for many years and I received conformation of this fact by email in 2002 yet there has never been any recent photos of this iris in any NZ publications, so today you could be viewing it for the first time!! The 1949 check list entry reads HARLEQUIN (Mrs J. Stevens, R. 1947). Sdlg. 3/T147. TB, M, W8D. (Sdlg. X Tiffany). Had there been a system to edit entries when more information came to light it could have been adjusted to read as follows HARLEQUIN (Mrs J. Stevens, R. 1947). Sdlg. 3/T147. TB, M, W8D. 3/T147. Manchuria x Tiffany. As my judgment has been questioned in this matter recently, I have included copy of the hand written entry from Jean Stevens Stud book 1943 Crosses. 2/P74 is of course the iris MANCHURIA registered by Jean Stevens in 1944. So whats the fuss you might say,Why is it so special? In 1961 'Frances Elizabeth' received an Honorable Mention from the American Iris Society for a Louisiana. By 1963 it was runner-up for the DeBaillon Award, and two years later 'Frances Elizabeth' won the coveted Mary Swords DeBaillon Award, essentially the highest award given for Louisiana irises. 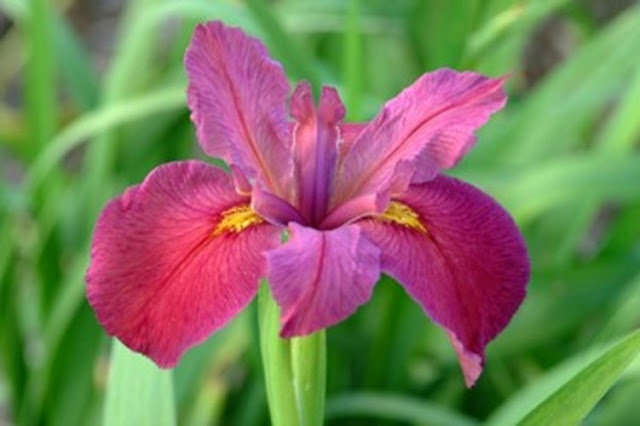 'Frances Elizabeth' was the first non-American iris to win the DeBaillon. To put it in layman term's this iris won the equivalent of an 'Olympic Gold Medal' in the world of Louisiana Irises and hardly anyone in New Zealand knows about it!! Sam Rix, a New Zealander, bred Louisiana Irises as a hobby at Mt Maunganui, New Zealand. He was the proprietor of the Oceanside Hotel, Mt. Maunganui. 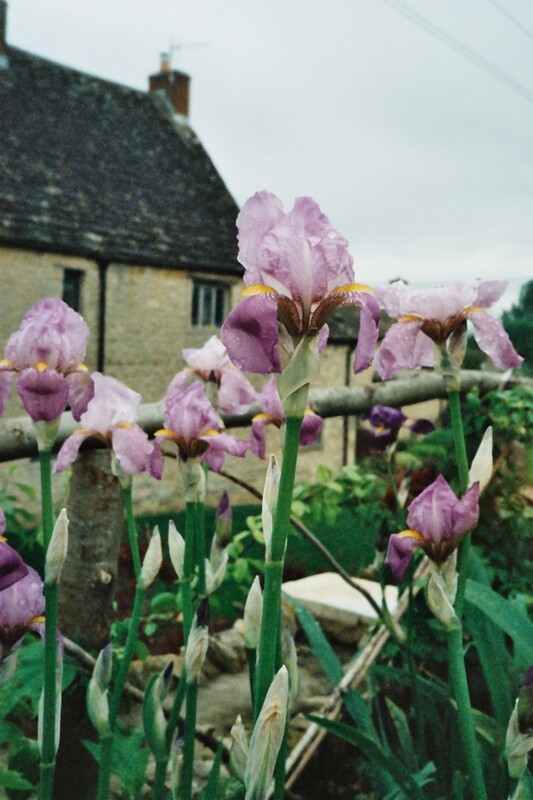 Sam originally started growing Aril Irises but had limited success due to the position of the gardens so started to grow Louisiana Irises from seed he imported mainly from a grower in Australia. Most irises were grown at the Mount in sand enriched with manure. Sam often used to say "Poised on their graceful stems the blooms remind one of gorgeous tropical butterflies, their carefree charm is vastly appealing and their great diversity make growing and breeding them a constant adventure"
FRANCES ELIZABETH (Rix, R. 1957). Louisiana 24" L. VRO1.Purplish-bronze self, dark mulberry-purple spine in standard; clear gold signal. Unknown., Melrose 1961. In the same year 1957, Sam registered Frances Elizabeth he also registered another Louisiana ' BILLIE LOUISE' in 1958 another 'Louisiana 'PETUNIA BUTTERFLY' and in 1978 twenty years later the Louisiana ' LOUISE RIX' was registered which was introduced by Jean Collins so could still be around. I have not been able to find any of the additional irises mentioned above catalogued by any Iris Nurseries in New Zealand to date. 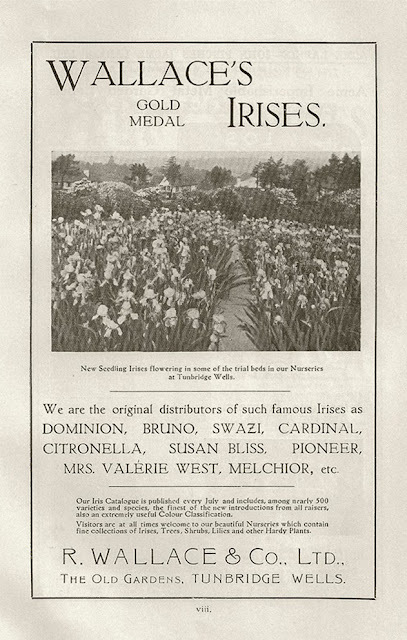 So to all New Zealand Gardener's when you are thinking of planting Louisiana Irises in your garden, and its still a good time to plant them, give 'THE IRIS PATCH' a ring or drop them a line, visit their Web site, and support a nursery who is prepared to preserve and promote a special part of our Iris Heritage. A huge thanks also to Greg McCullough of Iris City Gardens in America for the use of the outstanding photo which has allowed all New Zealander's to view a special part of Iris history. Top marks to you both. IRIS CITY GARDENS in Nashville, America have a extensive on-line catalogue, specializing in beardless irises; Louisiana, Japanese and Siberian. And also carry a number of virginica, pseudacorus, versicolor, laevigata and species cross iris. Also a great collection of historic,and newer bearded irises. 'Frances Elizabeth' also available! !